Specifically for the Cornerstone model, these signs are installed using a direct bury method. Each monument sign is shipped with customized installation instructions. A typical size and model of sign has been used for the following information. Please speak with your consultant about any special installation considerations for your particular sign. Dig the appropriate size hole or holes as indicated on your sign's footer drawing. Some sizes and models of signs only require one hole, while others require two. Using 2x4 lumber, create a single form that encompasses the hole(s). Refer to your footer drawing for exact dimensions. Recess the form into the ground so the top of the form is even with grade. Using a level, ensure that the form is level in all directions. Remove the sign from its crate. Lay the sign flat on a smooth surface. 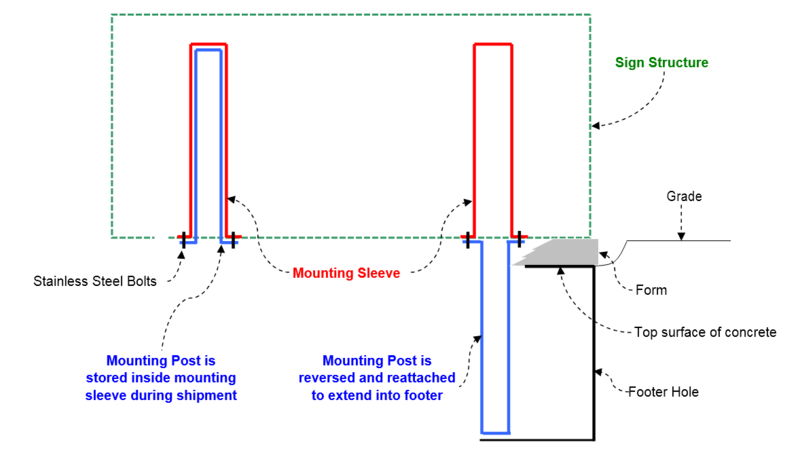 Unbolt and remove the mounting posts from the mounting sleeves. Reverse the mounting post (having it stick out from the sign) and reattach to the mounting sleeve plate. Place the sign onto the form with the mounting posts extending into the center of the footer holes. Check to ensure the sign is level and plumb. Use shims to adjust if necessary. Begin to add concrete to the footer holes. Keep the surface of the concrete 4 inches below grade to allow future access to mounting bolts. Use the bottom of the form as your full mark for the concrete. Allow concrete to fully set and remove forms. Using wood chips or other loose landscape material, backfill around the base of the sign.